Burrowing through once pristine landscapes, moles are tricky creatures that can be extremely difficult to control or eradicate. If you are facing a mole control problem, here is some advice from the Washington Department of Fish and Wildlife on how to prevent these pesky pests. According to the WDFW website, scare tactics are generally not effective on moles, since moles are often subjected to loud noises and vibrations in their underground habitats. There is no evidence to support that loud noises cause moles to leave an area, so save your firecrackers for the Fourth of July. Though it may seem like everyone you meet has a secret mole repellant recipe, no substance has been proven to repel moles in Washington State. Repellants that aim to injure a mole, such as glass and barbed wire often become more of a hazard to humans than they are to moles. Property owners may legally kill moles that are causing problems on their property. Some of the legal methods of lethal control include gassing, flooding, poisoning, introducing natural predators and killing with blunt force. Skagit Farmers sells gas cartridges that poison the air inside mole tunnels. From July 30th thru August 5th, Skagit Farmers has Atlas Giant Destroyer Mole Bomb on sale. See our current flyer for details. Follow the manufacturer’s instructions on how to use the gas cartridges safely. This method is most effective when the mole tunnels are new and not complex. Once a complex system is established, gas may not reach far enough into the tunnels to affect the mole. Trapping was once considered a reliable and effective way to remove a problem mole, however body-gripping traps are no longer legal in Washington State under any circumstances. It is recommended that any lethal methods be used in the late winter/early spring, before moles give birth. It is important to note that moles are very common and a yard that is mole-attractive may find a new tenant once the first mole is killed. 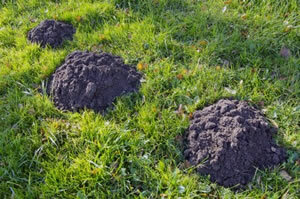 If moles return to your property you may want to consider speaking with a local expert that can help you better understand your options for mole control. Our stores are staffed with professionals that can advise you on which products and methods have been effective locally. Don’t hesitate to stop by to talk with us about mole control.